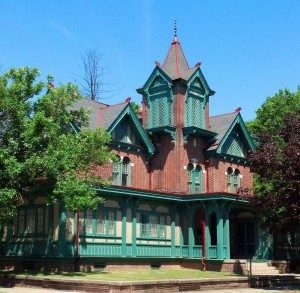 One of Dover’s most unique Victorian houses is at the corner of State and Mary streets, with its intricate brick-work, square tower, and Tudor-style windows and trim. Deeds reveal the property was sold by Henry Ridgely and his wife Virginia to Edwin O. Eccles in September 1883, but make no mention of the house. However, it must have been built by 1885, since it appears on an 1885 aerial map of Dover as the northernmost house on North State Street. In April 1904, Eccles’ widow, Amanda F. Eccles, sold the house at 300 North State St. to James Francis Allee. Allee, the son of a jewelry store owner, sold his father’s business and opened a cannery in Dover, the Liberty Brand Canning Co. He married Elizabeth Stevens of Camden. Active in the Republican Party, Allee served three terms as a state senator, then was elected to the U.S. Senate in 1904. In 1926, Allee and his wife sold the house to their son, James Francis Allee Jr., and his wife Elheurah, who in turn sold it to Allee, Inc. in 1929. A modern-looking proposal from May 1929 shows the younger Allee’s ambitious plan to add on and transform the mansion into the “Tudor Manor Hotel” offering 52 guest rooms. The booklet includes photos, an architect’s rendering and floor plans, and even an endorsement from the mayor. The hotel was to open in January 1930, but the project didn’t materialize. Maybe Allee didn’t get financial backing, or maybe he just lost money in the stock market crash. Instead, the house became Elheura Apartments. Benjamin F. Johnson and his wife Mildred bought the property in 1939 and renamed it to Mil-Ben Apartments. “We’ve always referred to it as the Castle,” said Mr. Harrington, noting it has 11 apartments and 55 rooms.